Is there some way we can get Major League baseball Commissioner Bud Selig to let the Cleveland Indians play Kansas City every day? The Tribe rolled through the Royals in three games at Kauffman Stadium, scoring 32 runs in the process. 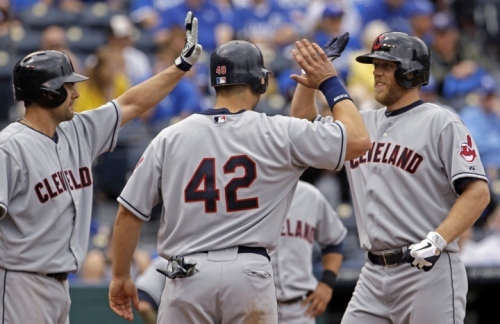 The Indians have now won three-of-four to move within 1.5 games of the allegedly unbeatable Detroit Tigers. After scoring eight runs in the series opener on Friday night, the Tribe added 11 runs on Saturday and 13 more on Sunday, the first time in the team’s 111-year history that it has scored eight or more runs in the first three road games of a season, according to ESPN. The good part was the offense was spread up and down the lineup. Michael Brantley hit .353 with three RBI, Asdrubal Cabrera was .375 with two RBI, Shelley Duncan hit .333 with four RBI and a big homerun on Sunday, Carlos Santana hit .333 with two RBI, Casey Kotchman hit .455 with three RBI and Jason Kipnis hit .364 with five RBI. That kind of balanced attack is what the Tribe is going to need to be successful this year. With Carlos Santana, and maybe Cabrera on a good day, being the only big-time hitters in the lineup on a regular basis, everyone needs to carry the water for the Indians to have a chance to win. And while he only had four hits, Shin-Soo Choo drove in six runs, making the Royals pay for using him as target practice. We kind of overlooked Choo coming into the season in all the angst over whether or not the Tribe’s offense can be good enough to compete this year. If he’s healthy and can return to his performance of 2009 and 2010, when he hit .300 and averaged 21 home runs and 81 RBI, then that’s as good as adding a bat to the lineup since Choo missed half the season last year. As good as the offense looked over the weekend, we are starting to worry about the pitching. Derek Lowe was solid on Friday in running his record to 2-0 with an ERA of 1.98 in two starts, but Ubaldo Jimenez was back to being the enigma on Sunday. After looking so good in his first start, Jimenez lasted only five innings against the Royals, giving up nine hits and four runs while somehow throwing 112 pitches. It seems more than likely that this is what we’re going to see from Jimenez all year. He’ll tease us with a dominant start like the one against the Blue Jays, then follow it up with a pedestrian (or worse) effort. His performance over the past year-and-a-half gives us no reason to expect anything else at this point. The bullpen had its share of problems as well, as they combined to give up eight runs in 10.2 innings of work over the weekend (not counting Josh Tomlin’s emergency appearance on Saturday). It seems to be the Cleveland way: once one facet of the team gets fixed something else starts to fall apart. We’re confident the bullpen will be alright; hopefully the same can be said for the offense. After starting the season 1-3, the Indians have worked their way back to .500, which is the first step toward a winning record. For now, it’s on to Seattle to see if the offense can stay on track against old friend Eric Wedge.